Stripe is growing at breakneck speed, and it has been for years. At the beginning of last year, it had 350 employees. Now, having freshly moved into Dropbox’s old digs South of Market, it’s at 750. But according to COO Claire Hughes Johnson, the biggest challenge the company faces isn’t bringing enough new people on board. It’s integrating them into a complex organism that can’t stop/won’t stop moving forward. Figuring this out (continuously) is her mandate, and there are few people in tech operating at her level. Stripe is in a rare and aspirational position these days. While growth has leveled off for many of the unicorns in its generation, it’s maintained its rocketship trajectory. When asked what wisdom she has to share from this experience, Johnson offers the following: There’s a list of questions companies should ask themselves as they head into rapid growth — ideally in that relatively brief moment right after clinching product-market fit. The key, she says, is pausing just long enough to be very intentional about how you approach each phase of growth. It’s easy to become too reactive, and when that happens, you’ll inevitably start to make human resources mistakes, execution mistakes, prioritization mistakes. So whether you’re in that moment right before growth — or you’re on your way there — press pause. Read through Johnson’s list of questions, and make sure you’re answering them as you go. 1. Have we documented our operating principles? When you hit growth, a lot of unprecedented things start to happen, and you’ll feel like you have no guidelines to make good decisions. On top of that, many new people who were not there when the company started will need to make decisions too. They need a framework to help them do that. Users first: “We always start with what our users need or would like, and then consider things like like infrastructure, internal constraints, partnerships, product roadmap, and so on." You can find the full list, which they published publicly, here. Your principles should be clear and explicit enough that the people who consult them will make the same decisions a founder of your company would. They should also be defined in a way that acknowledges potential tensions. When two principles seem to conflict, the context should tell you which principle should take precedence. For example, “think rigorously” is paramount for high impact and irreversible decisions, but “move with urgency” is critical for decisions that are lower impact and potentially tunable. In this way, your core tenets serve more as a guide to action than a toothless list of nice-to-haves. This also makes them a useful rubric for hiring new people and assessing performance. Do candidates have aptitudes or experiences that align with your operating principles? Do existing employees execute their responsibilities in a way that upholds them? You should bake your operating principles into both your hiring and performance review processes to make them useful and keep them top of mind. This is an all too common failure mode: A startup’s founding team uses a set of unwritten beliefs they all implicitly know and agree with to make hiring decisions and product decisions — but they never get said out loud or documented somewhere central. If you’re a leader at a company, do you know what these unspoken, unwritten things are? Have you categorized the common types of decisions you need to make? Have you documented the beliefs that guide how you make those decisions? If not, pause, and do that now. 2. What structure is going to help us achieve our goals? Along with growth comes the need for formal management. Even if you’re committed to staying pretty flat, you need make responsibilities and escalation pathways clear. “Flatness is really a state of mind,” says Johnson. “You can make your org feel flat while still having a good chain of authority in place so people don’t have too many direct reports, and there’s a clear way way escalate issues. We do it by not having a lot of titles or signals of seniority, because we want all people to speak up and contribute. Whether or not you get included in a meeting is always about how much you know about a given issue or problem, not about hierarchy. But everyone still explicitly knows who their manager is." This is what works for Stripe. But every company needs to decide on a structure that fits their specific goals. Maybe you need more hierarchy to execute on very complex processes with a lot of hand-offs. Maybe you need less because you want all employees to be immediately responsive to customers’ questions without having to double-check with someone else. At the beginning of any company, everyone is doing whatever it takes to succeed. When you enter growth, that no longer works. People need to be connected linearly to success metrics. 3. Who has been successful at our company so far? Maybe you’ve hired 20 people or just 10 — that’s still enough to pattern match what kind of person is good at working for your company. “Take the time to ask: Okay, what kind of people have we hired? Are they a diverse enough group to bring different perspectives and experience to the company? Who’s doing really well? Who’s scaling at the same pace as the company? What are those people’s characteristics?” says Johnson. In fact, making a list of their attributes is a good way to either define, reinforce or tweak your operating principles to make sure they’re aligned. The people who scale with your company are the ones who anticipate what they need to learn now in order to excel at what their role will become in six months. They’re curious enough to look ahead. They aren’t content with or consumed by simply doing their present job. When Johnson first joined, Stripe’s international coverage was new. There were individual country managers working as generalists to get the ball rolling wherever they were stationed. But as the company grew, these people needed to transition into serious team builders — a few of them eventually running large organizations of their own. Some of these country managers scaled into these new roles. Others didn’t because they couldn’t gain the skills they needed to build and manage growing teams while producing results. As the company brought on new country managers for further expansion, they hired candidates based on pattern matching with the type of people who had already been successful in this role. By and large, these were employees who relished the challenge of expansion to such a degree that they were willing to put in the time to learn, asked for constant feedback, and were relentlessly educating themselves about their local markets. She occasionally finds it helpful to plot members of the team on a Venn Diagram with three circles: People who are good at their work, people who are making great impact, and people who love what they do. 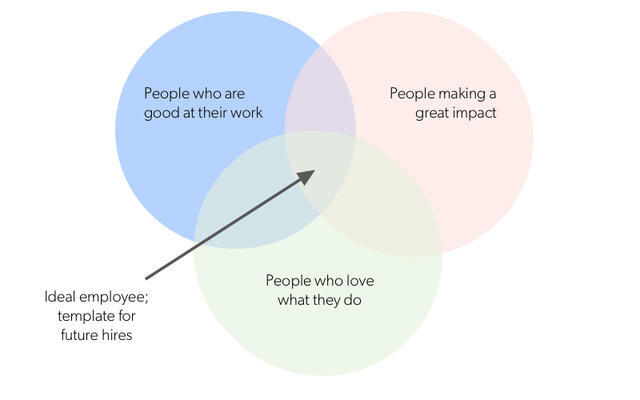 The ideal employee fits into all three circles. Make a list of all the people who fall into this bucket. What other qualities do they have in common? What questions can you ask during recruiting to suss out whether a candidate shares those qualities? 4. Do we have a 5-year plan? Johnson is a big believer in companies writing down a long-term plan. But the key point is: it shouldn't be long. It shouldn't be some monumental, time-consuming ordeal. It should be as simple as three to five paragraphs briefly describing the biggest, macro goals the company wants to make sure it’s pursuing over the next five years or so. Johnson worked on the first draft of this document with Co-founder Patrick Collison. The entire leadership team workshopped it for a few weeks, and then it was published to the whole company. As part of developing the plan, the executive team got together away from the office and designed a day that was entirely focused on the task at hand. “I find that a lot of people talk about achieving ‘flow state’ as an individual — that feeling of being so at one with your work that you’re able to be more creative and develop new ideas,” she says. “Very few people talk about how to get into flow state as a group. But they should. When we do planning, that’s what we try to get to — a shared sense of purpose, with all our brains trained on one outcome.” She recommends this approach to companies looking to develop a longer-term approach. Also important: the plan you publish should be stored somewhere central where it can be easily referenced. And it should be core to new employee onboarding, alongside your operating principles. It may be tweaked over the years as you learn about your business or customers, but ideally, the goals you enshrine in it should be so intrinsic to why you founded the company that they don’t change much. Once you get traction, suddenly everything is an exciting opportunity. A long-term plan forces you to make good decisions with limited resources. 5. Do we have a way to measure the employee experience? I can see the relationship between what I do and the overall goals and objectives of Stripe. I have enough autonomy to perform my job effectively. I am appropriately involved in decisions that affect my work. I have the opportunity to do what I do best every day. I have opportunities at work to learn and grow. I would recommend Stripe as a great place to work. While Stripe has performed well on this question to date, startups can use the results of this query to determine what to do next. If you get a negative response to this question, it’s likely that you’ve overstaffed, so that some people feel like they’re just doing busy work or they’re responsible for too small a fragment of the company. The other reason you might be getting this result is if either senior leadership or people’s managers aren’t very good at articulating the company vision and how it relates to the responsibilities at hand. Johnson recommends collecting sub-data on these questions to diagnose what the problem is. Regardless, it’s vital to fix it. If you as a leader don't believe that the work you do every day is important, your team isn't going to believe it either. That puts you in a very dangerous spot. 6. Are we decentralizing decisionmaking? One of the biggest challenges any growing company faces is equipping employees with the information, agency and confidence to make decisions for the company on their own. As a founder or executive leader, you can’t always be there to make a call. You have to trust that others can do it in order to keep pushing the frontier of your business. To make this possible, Johnson subscribes to the same method as medical residency programs: See one, do one, teach one. When you’re a surgeon, this is how you learn — and how you eventually become qualified to make snap, life-altering decisions in the operating room. This is also how you can train people up at a tech company — demonstrate how you want work to be done, have them do it themselves, then have them teach new people who are being onboarded what they’ve learned. The act of teaching, in particular, is powerful for internalizing information and making actions second nature. This is how Stripe has empowered people to make good decisions, no matter how many steps they are away from the founders. For example, when Patrick and John Collison started the company, they had very clear opinions about the brand they wanted to build — particularly the design philosophy. They believed strongly that the software should be beautiful, which differentiated them in their B2B market. Over time, this has distinguished Stripe as a leader in the field. To make this possible, the founders had to pass on their design sensibility to a team of new people who would carry it forward the way they would have themselves. When the design team was just starting out, the founders created a design review process that would allow them to offer their opinions and ask guiding questions at checkpoints along the way. Eventually, the design leaders on the team took this over as they brought on new members — asking the same set of questions at the same checkpoints. They became the teachers for a new crop of designers who would then learn the criteria, questions and goals to consider when designing something new. A similar process was established on the business side: deal review. Stripe's leadership still maintains a deal review for unusual deals. Documentation is critical to supplement the impact of these review meetings. It’s important that you start categorizing the common decisions teams have to make, so you can create rules and methods around how to make them. If a decision is irreversible and very high impact for the company, it should be made with a lot of data and rigor; it should involve more stakeholders, and maybe multiple teams. Think product pricing as a perfect example. If a decision is reversible and relatively low-impact for the company, an individual should be able to apply their best judgment based on the company’s operating principles and plans (this is where those documents become key). This could include UI changes, customer service responses, etc. You can think of this in a two-by-two format where impact is on one axis and ability to reverse or bounce back on the other. Most projects can be plotted somewhere on this chart. Based on where they land, you know better how to proceed. For Stripe, this has minimized the number of people who aren’t sure if they can make a decision on their own or not. And it’s minimized the time they spend checking with their managers and getting validation. Combined, this has saved significant time and resources for the company. 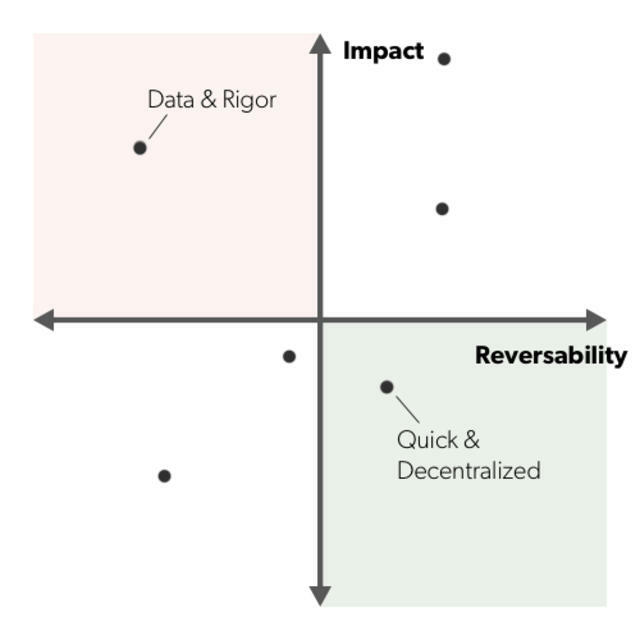 Using this framework to empower decision making has also been replicable and scalable. Employees who are familiar with it can now pattern match which types of decisions require which types of actions — without predicting every single type of decision that could be made in advance. To grow successfully, you need to keep pushing the ability to make decisions down through the ranks, so that the people closest to the work can make high-quality, responsible calls. Stripe makes it a priority to localize decision making as much as possible. Not localizing problem-solving is a secret killer of companies. Nearly all of the questions you should ask before you scale are about making trust central to your company’s operations. As a founder, can you trust hundreds of people — including many new people every month — to do their work the way you would do it? You’ll only be able to answer yes if you trust their judgment, and the only way to trust their judgment is to — above all — hire well. Beyond that, provide the people you’ve hired with the information, resources, tools, and mental models they need to understand your priorities, intent and objectives. If you can supply these things, you’ll be on your way to creating a multi-brain organism, smart enough to take on multiple, enormous tasks at the same time. You’ll be capable of launching a big new feature set while also restructuring compensation. You’ll be able to keep your hiring engine firing on all cylinders while jumping on an emergency need from a marquee customer. This ability to parallelize complex actions is a whole new plane of existence for companies. And if you’re just headed into rapid growth, it’s the goal you should be targeting from the beginning.